Widening current account deficit: This is resulting in creating more actual as well as speculative demand for the dollar and other convertible currencies. Policy inaction: Perception of lack of clarity on the policy front is also fanning speculative demand wherein the Reserve Bank of India (RBI) on one day said it will tighten liquidity and on yet another said it will inject $1 billion in the market. Low forex reserves: India's foreign exchange reserves are enough to cover imports of only seven months. The forex reserves have declined in the recent months. Due to low reserves, the RBI can't intervene aggressively in the currency markets. Growth slowdown: India's gross domestic product (GDP) growth fell to a decade low of 5 per cent in 2012-13. The situation is unlikely to improve much this year. Foreign investors are pulling money out of the Indian markets due to slow growth. Dependence on foreign money: India's current account deficit was financed by foreign money for the last many years. 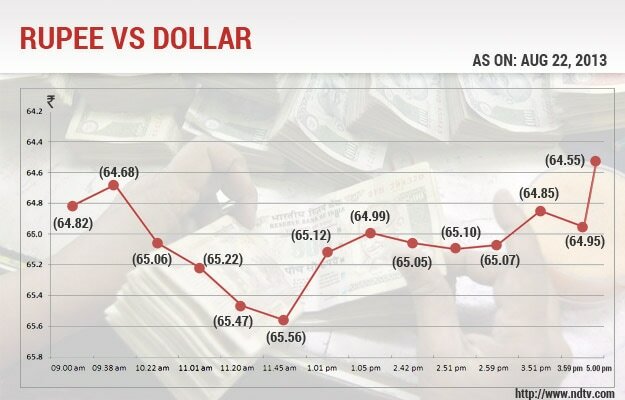 Withdrawal of money by overseas investors is leading to the weakness in the rupee. Recovery in the US: The slow but steady recovery in the US is making the greenback stronger against other currencies. Stimulus withdrawal: Indications that the US may withdraw or ease the fiscal stimulus package could potentially put the brakes on funds for developing economies. Capital controls: The decision by the Reserve Bank and the government to impose temporary restrictions on capital flows has not gone down well with the markets, as it will not only discourage Indian companies from investing abroad, but also foreign firms from pumping money into India. Trends in other markets: The rupee is also following the trend seen in the currencies of other emerging economies such as Brazil, Indonesia, Russia and South Africa. Speculative trading: Speculative trading in the currency markets is putting further pressure on the Indian rupee.